We are a Mexican food family and tacos are the number one item along with nachos. Being we live in El Paso, what better product to use then Old El Paso? It truly is the brand I turn to for nearly all my Mexican food ingredients. While living in El Paso, I have picked up some variations on how I used to make tacos and nachos and loved having the opportunity to try them out as my Old El Paso gift pack arrived. As you can see, it's a really cool prize pack that really motivated me to try it out that night as I had everything on hand especially since the gift pack included everything except cheese, meat and salsa. Our twist on tacos is deep frying them as it adds a nice crunch. It's not the same as corn shell hardness but a light flaky crispiness that tastes amazing. 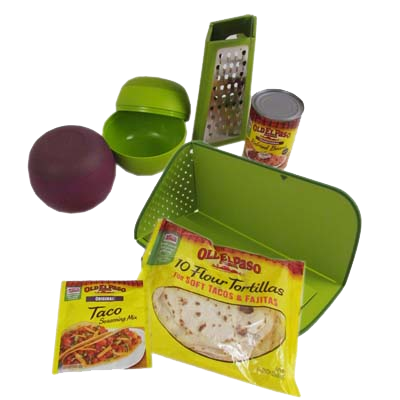 It's now the preferred way to fix tacos and I tried it out with our Old El Paso Taco prize pack. 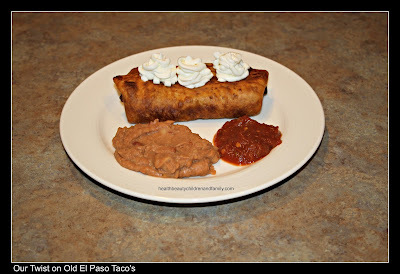 It's easy and it's just like making a taco except after filling it with the taco meat post cooking it per the taco seasoning package mix and adding refried beans to the meat mixture, I add a little cheese, fold over and secure with a tooth pick. Then I fry it for just a minute or so and then I let it drain on some paper towels. It's easy and quick and the kids love it! My nachos are similar as I just used the flour shell tortilla's from Old El Paso and cut in fourths with a pizza cutter to get clean lines. I then fry them for about one minute on each side, drain, let cool and then add a layer of beans and cheddar cheese and bake in the oven at 350 for about five minutes. They turn out crispy and perfect! 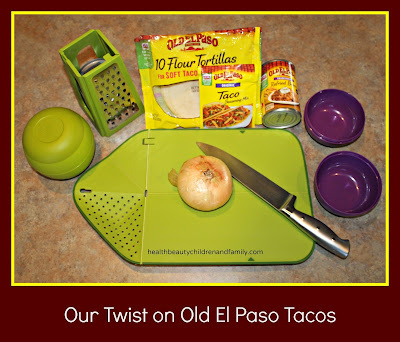 Check out Old El Paso for great recipes, product information and more at Old El Paso. *Disclaimer: I received this prize pack as part of my participation with My Blog Spark. The Sponsor, Old El Paso, provided the prize pack that I was able to review and the one that will be given away. The opinions are of my own. Creamy chicken enchilada is the recipe I would try and like. I found the Cheesy Chicken Enchilada Soup quite appealing. :-) Thank you. The Creamy Chicken Chile Enchiladas look good to me. The Tex Mex Bloody Marys look good! the Chicken and Black Bean Burritos look good, thank you! I like the seasoned oven roasted veggie recipe. the green chile bean burgers look amazing! I will have to make them! I'd like to try the Southwest Ranch Turkey Burgers recipe. The easy creamy chicken enchiladas sound delicious...and easy! I would like to try the Wild West Sizzlin' Chicken Tacos recipe. Easy creamy chicken enchiladas look delicious! I like their medium salsa. It's a product I've been using for years. Omg...Chicken Chili with Cornbread Dumplings!! The Taco Fries sound good. I would love to try The Creamy Chicken Enchilada Recipe! 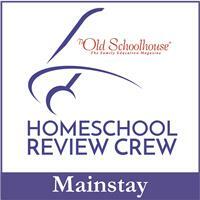 I would love to try the Beef and Bean Taco Casserole. The Southwestern Spaghetti Pie looks really good. The Southwest Ranch Turkey Burger is my recipe of choice! I want to try the Mexican corn on the cobb. Definitely the seven layer bean dip! The Beef & Bean Taco Casserole! I like the 7 layer bean dip. Of course, my version would be 7 different bean layers. I would want to make beer queso nachos. 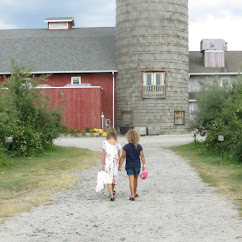 Yes I have vacationed in Idaho, it is lovely! Roasted tomato chicken tacos sound so good I think I might try it out tonight! I want to try the Layered Ranch Taco Dip! I'd love the Wart Topped Quesadilla Wedges!! Thanks for the giveaway… we like the Slow Cooker Carnitas from Old El Paso. I would like to try the burrito dinner kit.